*Do you require ice packaging? PLEASE NOTE THERE WILL BE AN ADDED COURIER DELIVERY CHARGE OF £6.30 (OPTIONAL BUT RECOMMENDED) FOR THIS PRODUCT. IT WILL BE SENT IN AN ICE PACK CONDITION TO RETAIN A LOW TEMPERATURE. Bifido Factor® is step two in Natren®’s easy-to-use three-step system for optimal internal wellness. Bifido Factor® contains Bifidobacterium bifidum Malyoth super strain, 2 billion cfu per 1/2 teaspoon of powder or 1 capsule. Bifidobacterium bifidum Malyoth super strain is the most potent and beneficial bacteria available. Natren Bifido Factor is available in powder (dairy and dairy free), and dairy-free capsules. This product works in conjunction with Natren®’s other Healthy Trinity® components: Megadophilus® and Digesta-Lac®. Just as Megadophilus® helps the small intestine stay in balance, Natren Bifido Factor® works in the large intestine to keep it healthy and help deter undesirable bacteria. * Bifidobacterium bifidum produces B vitamins that help the body complete the digestive process. * Bifidobacterium bifidum assists in the absorption of calcium and other vitamins and minerals. * Bifidobacteria lives on the intestinal wall, where it discourages undesirable bacteria from taking up residence and helps the large intestine dispose of unused foods. * Natren Bifido Factor helps to minimize elimination concerns. * Natren®’s milk-based formula contains natural Lactulose, a specific food for the Bifidobacterium bifidum which has been found to maximize liver support and proper elimination. * The powder begins working in the mouth and gives benefits all throughout the digestive tract as well as the large intestine. * Japanese researchers consider Bifidobacterium to be the most important beneficial bacteria for human health. * Produces lactic and acetic acid which lower the pH of the large intestine and deter undesirable bacteria. * Protects the walls of the large intestine from colonization by invading bacteria or yeast. * Inhibits bacteria which can alter nitrates into potentially harmful nitrites. * Natren Bifido Factor assists in the support of healthy liver function. * Helps to promote regularity. 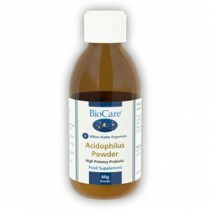 Both Megadophilus ® and Bifido Factor ® are available in capsules as well as powders. Natren ® uses hard veggie capsules and protects the flora by using natural moisture barriers that keep them from absorbing water from the walls of the capsules. A modified-release system developed specifically for Natren ® breaks the capsules apart over a five- to seven-hour period. Natren Bifido Factor capsules start breaking up in the stomach, and continue the process in the small and large intestines until all the bacteria have been released into the body. Natren Bifido Factor Dairy powder: Viable Bifidobacterium bifidum, Malyoth super strain on a culture base of nonfat milk and whey. Dairy Free powder: Viable Bifidobacterium bifidum, Malyoth super strain on a culture base of organically grown garbanzo bean (chick-pea) extract and cellulose powder. Dairy Free capsules: Viable Bifidobacterium bifidum, Malyoth super strain on a culture base of organically grown garbanzo bean (chick-pea) extract, cellulose powder and dehydrated potato powder in a veggie capsule. All formulas receive added benefits from the natural supernatant (culturing medium) that is maintained by Natren ® 's proprietary Trenev Process ® . Contains no preservatives, artificial colors or flavors. How the bacteria are grown: Natren Bifido Factor ® comes in a milk base, and is also available in a milk-free formula grown in an organically grown garbanzo bean base.